Clamp-on mounting style shown in photo; bolt-on mounting is also available. 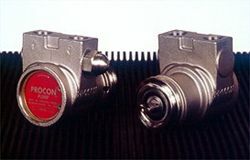 PROCON's Series 3 pumps boast all the unique features of other PROCON pumps. Because the pump body and all the internal parts are made from stainless steel, the Series 3 is well suited for pumping a variety of fluids not suitable with brass. Your PROCON factory representative can advise you on the correct pump for the fluids you intend to use. Dry Weight Approx. 2.75 lbs. Use your "back" function to return here.